Doctor Coplan continues his discussion of his revolutionary way of looking at ASD. The definition of autism is silent on the subject of intelligence. On the one hand, this is as it should be; ASD is defined by impaired social skills, impaired pragmatics and prosody (communication and speech inflection), repetitive thoughts and behaviors, and unusual sensorimotor traits, not impaired intelligence. On the other hand, long-term outcome for a child with ASD has everything to do with intelligence. Numerous follow-up studies (reviewed in Appendix II of my book have reinforced the truth of Bartak and Rutter’s initial observation. 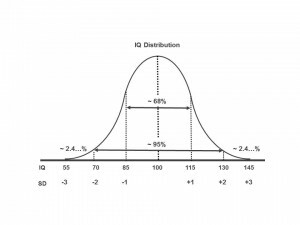 Most standardized tests of intelligence are designed to yield an average (“mean”) score of 100, and a Standard Deviation (SD) of 15 points. “Standard Deviation” is a measure of how bunched up or spread out the scores are, on either side of the mean (Figure 1). In an ideal sample, approximately 68% of individuals lie within 1 SD of the mean (34% will be 0 to 1 SD above, and 34% will be 0 to 1 SD below). Another 27% lie in the range of -1 to -2 SD or +1 to +2 SD (13.5% lie between -1 and -2; another 13.5% lie between +1 and +2), bringing the proportion of individuals who lie within 2 SD of the mean up to about 95% of the total. The remaining 5% are apportioned between the upper and lower “tails” of the curve: About 2.4% lie > 2 SD above the mean, and a corresponding 2.4% lie > 2 SD below the mean (the percentages don’t add up to exactly 100, because of rounding error, and in real life the curve is not perfectly symmetrical: the peak in the middle is flattened a bit, and there are more persons at the tails than predicted). Figure 1. 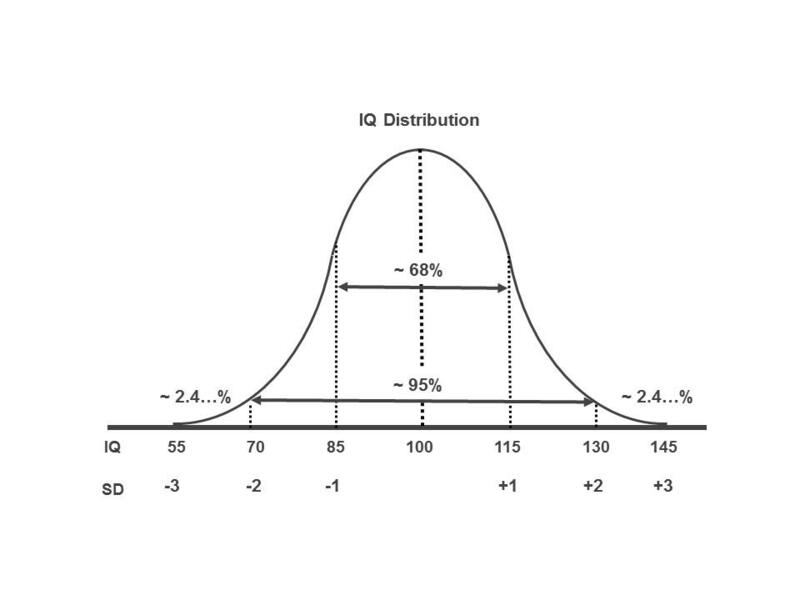 Relationship between IQ, Standard Deviation (SD), and the proportion of the population, in an ideal (“normally distributed”) sample. The little squiggle means “approximately equal to.” Percentages do not add up to 100 because of rounding errors. Roughly 95% of individuals lie within 2 standard deviations of the mean. The remaining 5% are apportioned between the upper and lower “tails” of the curve. For my purposes, a more useful way to display the data is shown in Figure 2. Here, IQ is displayed on a vertical axis. The IQ ranges have been labelled according to common clinical usage (Average, Low Average, Borderline, etc.). 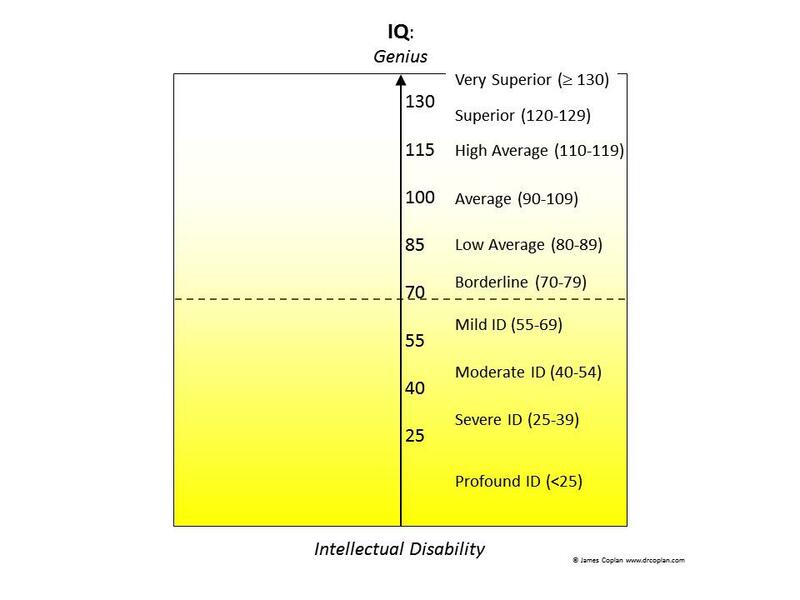 I have also added yellow shading, to represent the presence and degree of intellectual limitation, from solid yellow for Intellectual Disability, fading to faint yellow for Borderline IQ (which used to be termed “Borderline Retarded”). Figure 2. IQ ranges and their common names. Yellow shading corresponds to the presence and degree of intellectual impairment. 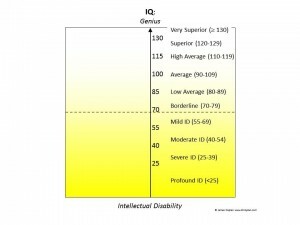 Notice that “Average” IQ occupies a 20 point band (90-109), while most of the others are 10 to 15 points wide. ID, Intellectual Disability. We know that any degree of atypicality can co-exist with any level of intelligence. (This is true even in the movies. Dustin Hoffman’s character in Rainman has severe atypicality and high IQ. Sean Penn’s character in I am Sam has moderate atypicality and borderline IQ. Alas, there are also a many individuals with ASD plus Intellectual Disability – although not in the movies). How do we incorporate this fact into our view of “the solar system” that is ASD? IQ is the biggest prognostic factor, other than ASD itself. 1. Bartak, L. and M. Rutter, Differences between mentally retarded and normally intelligent autistic children. Journal of Autism & Childhood Schizophrenia, 1976. 6(2): p. 109-20.